Bob Croasdale has lived in San Diego for more than three decades, most recently in a 1,800-square-foot home overlooking a picturesque golf course. When one of his employees moved her family to Las Vegas for a better quality of life, he started to wonder what the Vegas buzz was all about. He started exploring and digging around the city, and to his surprise, the benefits of living in the Entertainment Capital of the World started to add up. “Las Vegas’ unrivaled cost of living, no property taxes and unmatched array of dining and entertainment on the world-famous Strip drew me to the Silver State to start and a new life,” said Croasdale, who is a longtime owner of a tax and accounting business in San Diego. But Croasdale’s search was not an easy one, and he spent nearly nine months house hunting. Thanks to a recommendation from his siblings to look at high-rise communities, he found himself at One Las Vegas, the high-rise, twin-tower condominium community on the south end of Las Vegas Boulevard. “My real estate agent and I were in the lobby for less than three minutes when I turned to him and told him to cancel the rest of our appointments because I knew I was already home. I found a two-bedroom, two-bath residence with a spectacular view, an important feature given that I have long been accustomed to a golf course view from my San Diego home. I now live on the 13th floor, my new lucky number,” Croasdale said. Croasdale made such a large profit on his San Diego home he was able to purchase a recreational vehicle, which he now uses to commute between Las Vegas and San Diego where he still conducts business. 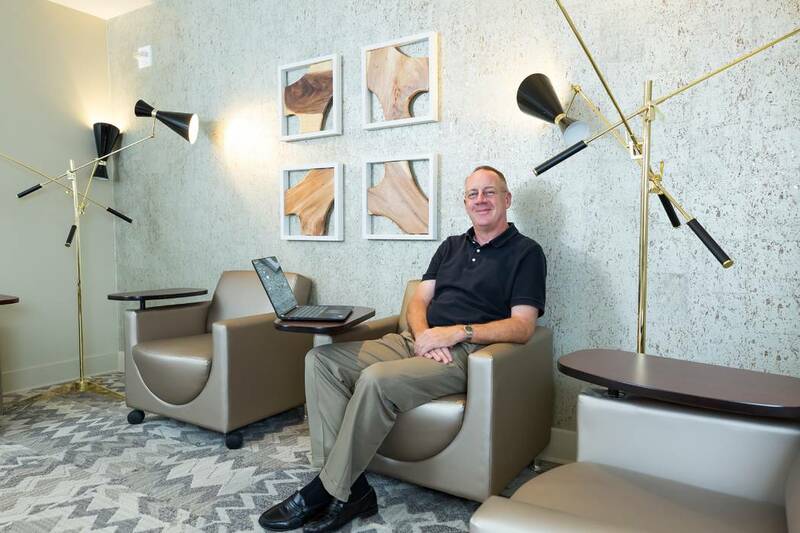 Since he moved to One Las Vegas in May, he’s enjoyed Splash, the community’s 24-hour resort-inspired pool; Touch, the spa; Play, the sports lounge with big screen TVs, billiards and arcade area; and Show, the community’s movie theatre. He also appreciates Network, One Las Vegas’ business center which he visits frequently to work remotely. “When friends visit, they love staying with me because I have dual master bedrooms. And when guests want to explore the Strip, it’s only a five-minute Uber ride from here,” Croasdale said. One Las Vegas homes range from 1,252 square feet to 2,857 square feet with many floor plans offering views of the mountains and the Strip. Two-bedroom homes are priced from the low $300,000s and three-bedroom homes from the low $400,000s. One Las Vegas received approval from Fannie Mae to offer financing options as low as 3 percent down for eligible first-time homebuyers and is only the second condominium community in Las Vegas since 2008 to obtain Fannie Mae PERS (Project Eligibility Review Service) final project approval. One Las Vegas also offers buyers Veterans Affairs guaranteed mortgages in addition to traditional 15- and 30-year financing options. One Las Vegas is close to Interstate 15, the 215 Beltway and just minutes from McCarran International Airport and is also in close proximity to the T-Mobile Arena and the under construction NFL Raiders stadium. Town Square, just a few blocks north of the property, provides one-stop shopping and scores of dining and entertainment options right in the neighborhood. For more information, call 702-405-9020 or visit the One Las Vegas on-site sales center at 8255 S. Las Vegas Blvd., or online at theonelv.com. The sales center is open Monday through Friday, 10 a.m. to 6 p.m.; Saturday from 10 a.m. to 5 p.m.; and Sunday from noon to 5 p.m.